Two Bare Feet offers a choice of Allround XL SUPs which will satisfy those who are of above average height or weight. Like our standard Allround boards, our Allround XL SUPs still cater for a wide range of abilities, from the first-time paddleboarder to the more accomplished. In addition, just like standard Allround SUPs, our XL models accommodate a range of disciplines, from surfing to long-distance paddling and general everyday use. The key difference lies in the fact that they are intended for larger and heavier riders. Our Allround XL SUPs all have a thickness of 6” which boosts the overall volume and allows the iSUP to accommodate larger loads. Similar to our standard Allround SUPs, our Allround XL boards are available in a range of widths and lengths to suit you. The balanced design of these boards means that manoeuvring, turning and responsiveness are not compromised by the additional board thickness and volume. Our boards are also inflatable to 22.5psi. This is the highest air pressure rating used by iSUP board manufacturers. This doesn't just guarantee a very stiff inflatable SUP; it also demonstrates the confidence we have in the overall construction and build quality of our products. At Two Bare Feet, Allround XL paddleboards have a 6” thickness. The heavier paddler will feel most secure on rigid 6" inflatable SUPs of decent, durable quality since the additional board depth adds extra volume which translates into additional buoyancy and stability – perfect for supporting the extra weight.4.75” thickness is for standard Allround SUPs, while a 4” board thickness is the minimum for a paddleboard, tending to be the lighter, child-friendly option. The Pacifico Allround XL offers a high buoyancy and volume to comfortably accommodate a larger adult rider and an additional kneeling person. There is extra-large bungee storage, meaning they’re a popular choice for families who want to go on longer outings. The 10’6” length and 33” width is fairly standard for Allround inflatable boards, resulting in decent overall manoeuvrability and stability. This model performs comfortably in all paddleboarding pursuits. Whether you’re into surfing or distance paddling, this Pacifico paddleboard will inspire confidence. The Entradia Allround XL paddleboard is perfect for medium to large-sized adults. Although there is slightly less storage space than the Pacifico Allround XL, this board has enough volume to float a large adult rider combined with another kneeling passenger. Again, this is great for families and makes it ideal for everyday use. The standard 10’10” length and slightly wider 34” width creates a solid compromise between stability, manoeuvrability and speed. Our newer Inviato Allround XL is a best seller. With the highest max payload off all our XL SUPs, it can accommodate a large range of riders (including families who all want to get involved). The 35” width of this design is quite wide for an inflatable paddleboard in order to maximise stability for less experienced riders; such stability will inspire confidence in staying upright, especially in somewhat challenging conditions. Like all our paddleboards, this board has been built to last. The single layer construction is made with quality reinforced PVC which is long-lasting and lightweight. The limited-edition Sport Air Allround XL has a larger volume in order to deliver extra stability and increased buoyancy. This volume, combined with the maximum payload, make it more suited to carrying additional riders. With its 10’10” length, it’s an excellent choice for beginners and skilled paddleboarders alike, meaning you can handle waves or calmer waters. It offers a wide deck for extra stability and is designed for all abilities to achieve relatively high speeds. The Phatpad Allround XL provides a full coverage deck grip and extra-large bungee system, making it a great option for carrying cargo, extra passengers or even your favourite four-legged friend! The standard length and width (10’10” x 33”) create a favourable combination of stability, manoeuvrability and control. We carry two exclusive ranges of Double Chamber Allround XL iSUP boards: the Sport Air Double Chamber and the Phatpad Double Chamber. In addition to the benefits offered by our other paddleboard variations, these two boards are – without doubt – among the highest performing XL Allround iSUPs you’ll find anywhere. Both models have a double-layered DWF PVC exterior for increased strength and rigidity. This is complemented by the double chamber construction which splits air distribution evenly between the two chambers. This makes both boards significantly more durable and increases rigidness by an additional 30%. All our boards are also available in a range of colour schemes, giving you plenty of opportunity to choose a board which fits your personality. Can I carry passengers on an Allround XL SUP? Our Allround XL SUPs, have enough board volume to comfortably support a large adult as well as one additional passenger, such as a child or kneeling adult. Should you wish to bring your canine companion aboard, our boards will be more than ready to cope with the unexpected. The topside of our XL Allround iSUPs have a protective heat moulded EVA deck grip, which helps prevent accidental damage from sharp objects – including animal claws. Our board models have either a 'large coverage' or 'full coverage' deck grip, which extends the protection available on the deck. 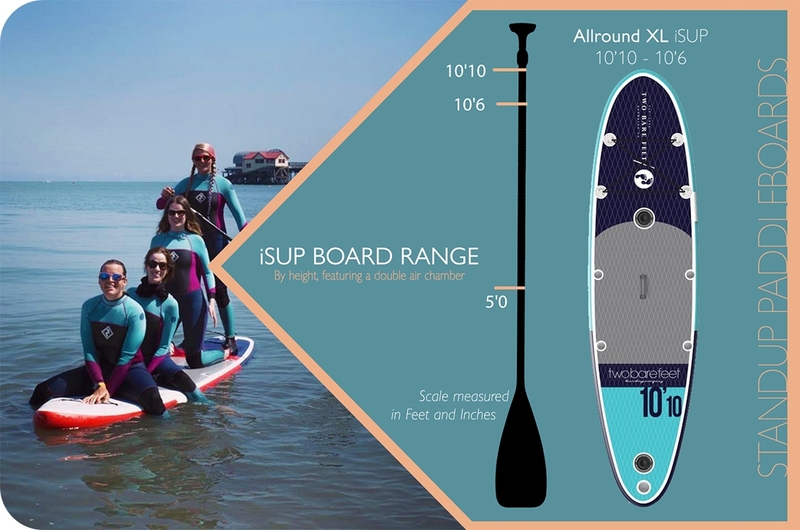 An iSUP’s weight limit is often dependent on the board’s thickness. For instance, a 6” thick board will carry 50% more weight than a 4” board with the same length and width. While a wider board provides more stability, a longer board can improve speed. Consequently, a higher weight limit often coincides with a thicker and wider board. Ideally, you don’t want to exceed a board’s weight capacity (or maximum payload) as it will force you lower down into the water. This can make manoeuvring more difficult, and result in unsteadiness and increased drag.